The Curiosity rover on Mars captured 57 images of itself, which NASA personnel stitched together into this "selfie." 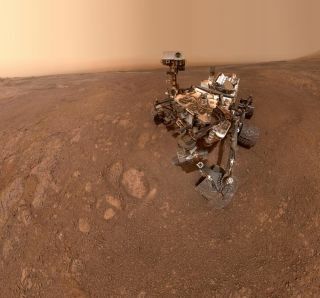 We all edit our selfies to capture our best side, and the Curiosity rover on Mars is no different, as shown in a new "selfie" NASA released to mark the rover's last days at Vera Rubin Ridge. Curiosity's favorite selfie trick isn't a matter of choosing the most flattering filter; instead, the robotic explorer favors stitching together shots to build a composite image, creating the illusion that a companion took the picture. The rover has used this approach for "selfies" before to stunning effect. While the result leaves the rover looking glamorous, the scenery is nothing to scoff at either. Curiosity's 19th drill hole, at a site nicknamed "Rock Hall," is visible to the bottom left of the rover, in the largeish rock. The picture also offers a dusty look at the neighborhood, which is weathering a dust storm right now. Curiosity captured this image as it prepared to wrap up more than a year of scientific investigation at Vera Rubin Ridge, named for the famous astronomer who discovered dark matter. Now, the rover's headed a bit farther south on Mars, toward a location that is heavy in clays (so far, it's just being called "Clay-Bearing Unit"). As Curiosity travels, it's doing a little science along the way, which should help geologists understand how the different rock types found at the ridge and the clay-bearing unit meet.